Lunchbox portions are sometimes difficult to navigate. 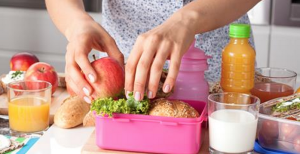 With prepackaged, convenience meals filled with bad ingredients like salty and nitrate-filled cold cuts and fried chicken pieces, health-conscious parents turn to making their own lunchbox choices for their kids. With that decision comes great responsibility, as how much food your children have access to remains your decision. You don’t want to send your children with too little food so that they are hungry during the day and unable to focus on school. However, you don’t want to send so much food that they gain weight or eat too much. In this blog, we break down how much food you should send your kids to school with, based on age. Toddlers need around 400 calories a day for lunch. Some days, you may choose to send less food, around 300 calories, to compensate for larger dinners. Make your own fresh quesadillas with a few tablespoons of shredded cheese, and serve it with some fresh salsa and carrots. This age group needs slightly more calories than toddlers. 500 calories for lunch should be enough. Prepare healthy sandwiches on whole wheat bread, and serve with celery and low-fat dressing, or fresh strawberries. During elementary school, kids need 1,700 to 1,900 calories a day. For most, this means roughly 500 to 600 calories allotted for lunch. Maybe serve whole wheat pasta salad with cherry tomatoes and local cheese. Pack it with a whole apple, perhaps served with a tablespoon of peanut butter. In middle school, the calories required for kids tend to be around the number of calories required for healthy adults, approximately 2,000 calories. This doesn’t mean that kids should eat the large portions most American adults eat, however. High school students should eat healthy adult portions, with one caveat. Many high school students grow until the end of high school or college, especially boys. If they are hungry, make sure they have enough food to eat. Monitor how much your high schoolers eat, and encourage them to eat more fresh fruits and vegetables as snacks when they are hungry, instead of prepackaged snacks. For more advice on how to make nutrition a major part of your life, contact us today for a consultation on how we can help take your nutritional plans to a new level.